The Konica Copier 7135 is widely considered an affordable option for those seeking a multi-functional printer that can deliver 35 pages each minute. It has been designed primarily for the workplace and comes with a wide range of advanced printing options for professional finishing. While some materials can easily be produced in-house, larger-scale print jobs or those requiring higher-quality printing would need to be outsourced. 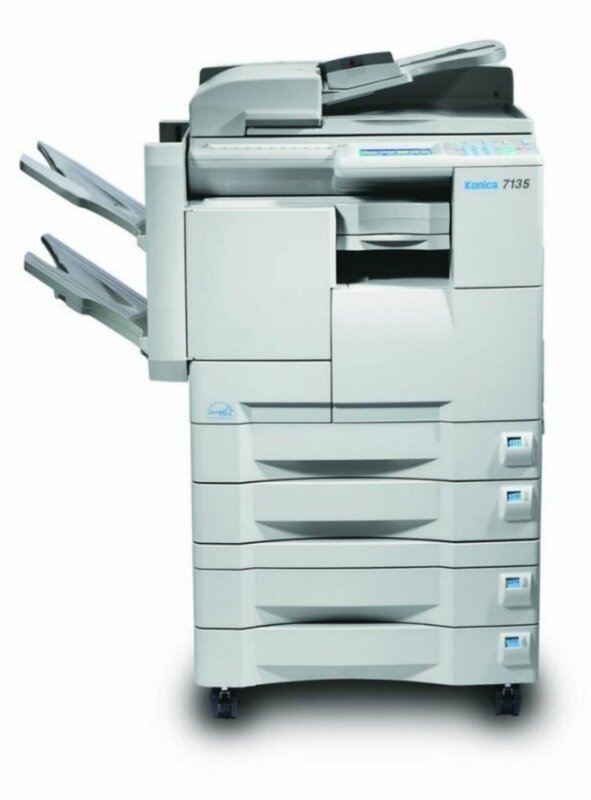 The Konica Copier 7135 is designed to be used on a wired network and has a maximum resolution of 600 x 600 dpi. The unit comes with standard memory of 32MB for copying, 64MB for print control and there is the option of a 2GB hard drive, which is required if the unit is to be used for scanning. Designed to handle paper between the sizes of A5 and A3 allows the Konica Copier 7135 to print on a wide range of media. In addition to scanning and copying, the Konica Copier 7135 also supports internet faxing, making for a versatile machine. Dimensions of the printer are 59 x 59.5 x 73cm, allowing it to stand on its own. It weighs around 72kg. The Konica Copier 7135 is user-friendly and has a touchscreen for easy management of tasks. The unit has a maximum sheet capacity of 2,500, requiring less maintenance, and users can access the print monitor utility, which is web-based. Remote workers are also able to check on the status of their print jobs this way. There are also some digital editing functions available. The resolution of the print at 600 x 600 dpi is around half that of other business machines that are designed with the same functions, so this may not produce the best-quality prints if the user is seeking to create marketing materials in-house. The unit requires a sizeable amount of floor space and should not be moved by one person.